When I was growing up, my hometown, San Francisco, was known (at least to the locals) as the "City that knows how." That reputation grew out of its triumphant effort of rebuilding after the 1906 earthquake and fire that leveled much of the metropolis. That formulation started to fade away about 1967 and is not much heard today. 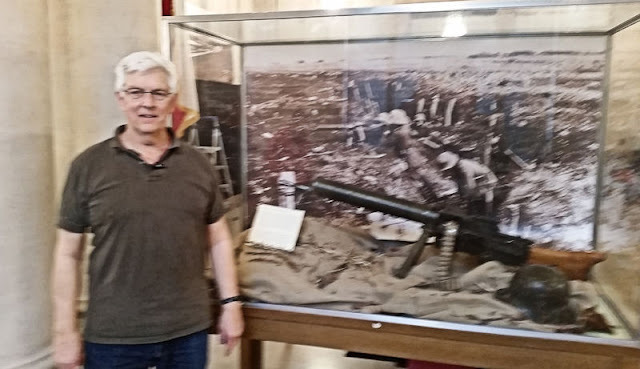 I'm happy to report, however, that San Francisco's World War One Armistice Centennial Commemoration Committee have shown that they "know how" to commemorate their nation and their city's service in the Great War. They have done a magnificent job and—as they sang during the Summer of Love—If you're going to San Francisco, be sure to visit The American Experience, 1918–2018. The Venue: The exhibition is being held in the Beaux-Arts Veterans Building of the much larger San Francisco War Memorial, the core of which opened in 1932. Not shown here are the equally impressive opera house, where the U.N. Charter and the final peace treaty with Japan were signed after the Second World War, a central garden created with soil from the American battlefields of the First World War, and a symphony hall, added in 1980. 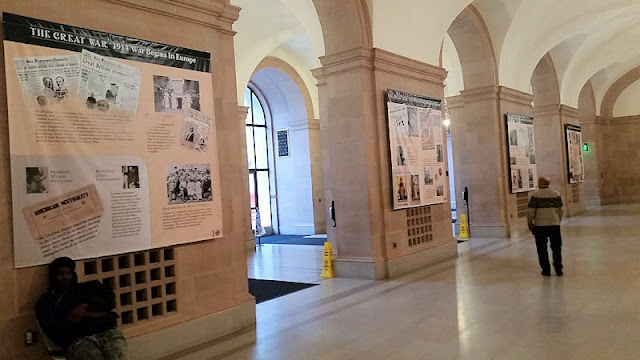 Lobby Entrance: Visitors are welcomed with eight informational banners that cover the general story of the war, the American experience in detail, and San Francisco's experience during the war. One of the eight large panels. Another panel focuses on the building of the War Memorial, which was a great civic challenge and dramatic achievement for the city. 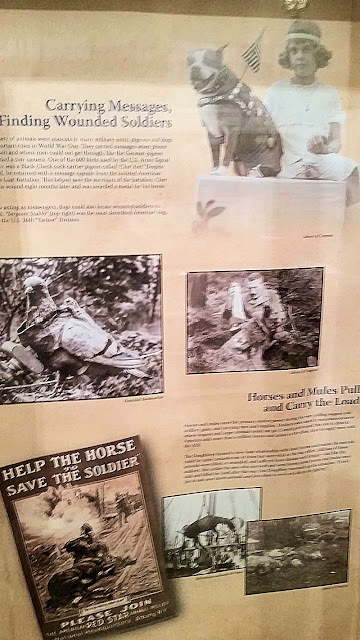 My friend Dana Lombardy was the exhibit's historian. Earlier this month Dana gave me a private tour of the presentation, explaining how all its elements were pulled together and introducing me to some of the team who made it all happen. 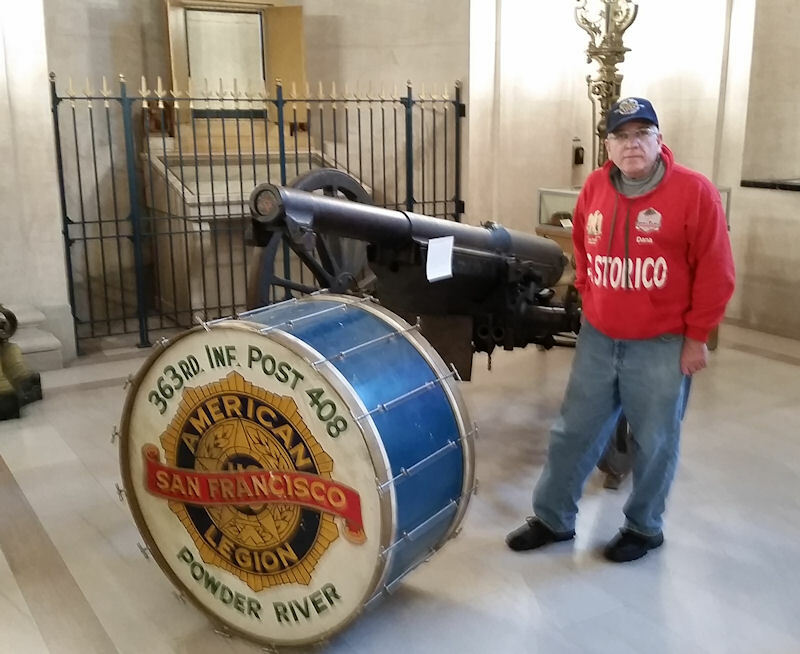 Here Dana is standing by a French 75 and the drum for the 363rd Infantry of the 91st Division of the AEF. The unit—composed mostly of draftees from San Francisco—fought in the Meuse-Argonne Offensive and Flanders. They were given a tumultuous welcome home in April 1919. The Veteran's Gallery: Off of the lobby is the main exhibit space. Displayed here are weaponry, informational kiosks, uniforms, and cases covering themes like trench and air warfare. 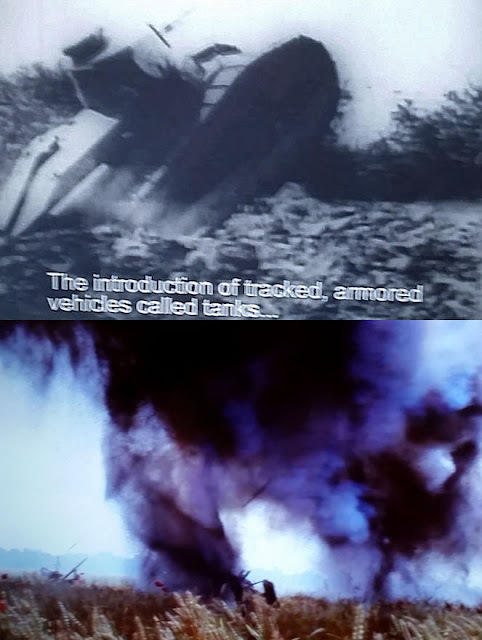 Two video players show footage from the war and the U.S. Marine Corps's reenactment of the assault on Belleau Wood. 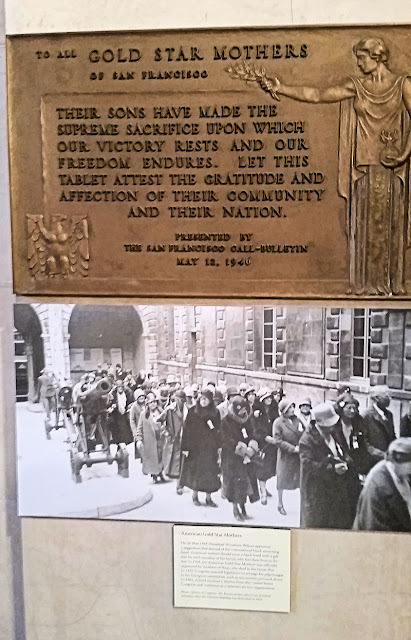 A display honoring the Gold Star Mothers of San Francisco, including a photo of their pilgrimage to their sons graves in the 1930s. Janice Tong, Special Assistant to the Chair of the War Memorial Commission, standing in front of a panel remembering local soldiers who served in the war. 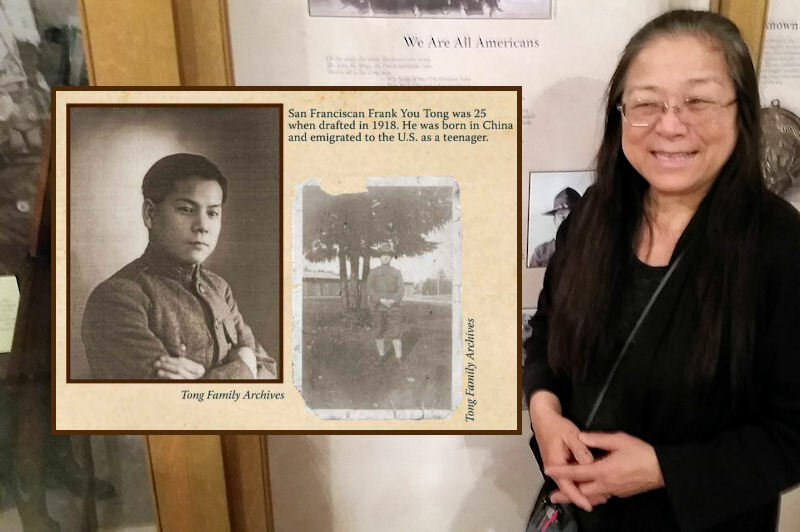 Enlarged is the section honoring her grandfather, Frank You Tong, who was a WWI Doughboy. 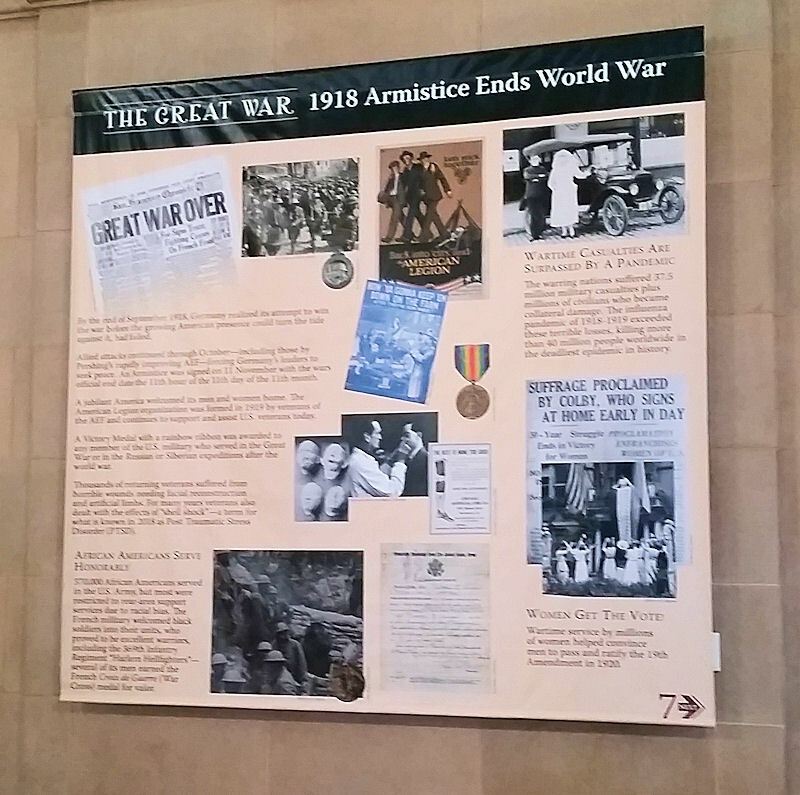 Following the same design scheme as the lobby banners are 12 smaller banners covering a variety topics about the war. The closing date of the exhibit is up in the air for now, but it is hoped that it will run through the end of June. The gallery exhibit will focus primarily on Black History Month during February. Looks wonderful - thanks for providing a fascinating glimpse!